Waiting On Wednesday is a weekly blog post hosted by Breaking The Spine where readers share which books they are highly anticipating. 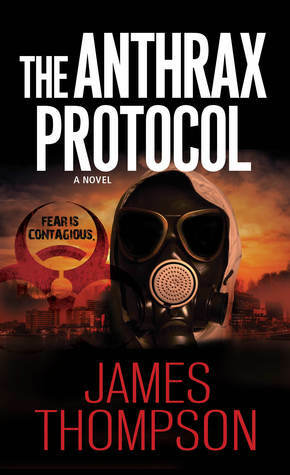 This week I want to share The Anthrax Protocol by James Thompson. Why I'm Waiting: I don't share them often on here but I am a huge fan of books, films, documentaries etc... that deal with biological catastrophes. These type of stories intrigue yet terrify me. I guess that's just what makes them so good to read though! Anyway, I knew when I read the premise for The Anthrax Protocol that this was one I'd have to read and I look for ward to getting my hands on a copy soon. Since I'm curious, Have you heard of The Anthrax Protocol before? This sounds really great and scary! I love horror and books about disease. Great pick this week :) I'm definitely adding this to my TBR! I know right?! Thanks for stopping by and sharing your pick as well (which is equally awesome sounding). I definitely approach books and movies about tragedy with trepidation... it kind of freaks me out! but i really hope you like this one when you get to it! I can understand. Thanks for stopping by! I've never heard of this one, but it sounds really good! I'm going to add it to my TBR. Thanks for sharing! Thanks, also, for visiting my WoW! Hope you have a great weekend!